Well this could be one of the oldest Tibiaball movies in existence. It was traditionally played with a bear. In blue you see the Alliance of free Tibians. In black (what else) the Mercenarys. Have fun with this thrilling Tibiaball-game. Knightmare teasing me with the knowledge that the question was solveable. As you perhaps know. The Question about Hugo was long time not known. For many months people tried to solve it. As i was once again there to check it out, Knightmare teleported to me and whispered the right answer to the riddler. That was very evil back then. He didn’t tell me any hint. he just showed me that it was solveable. But more on this topic on another post. 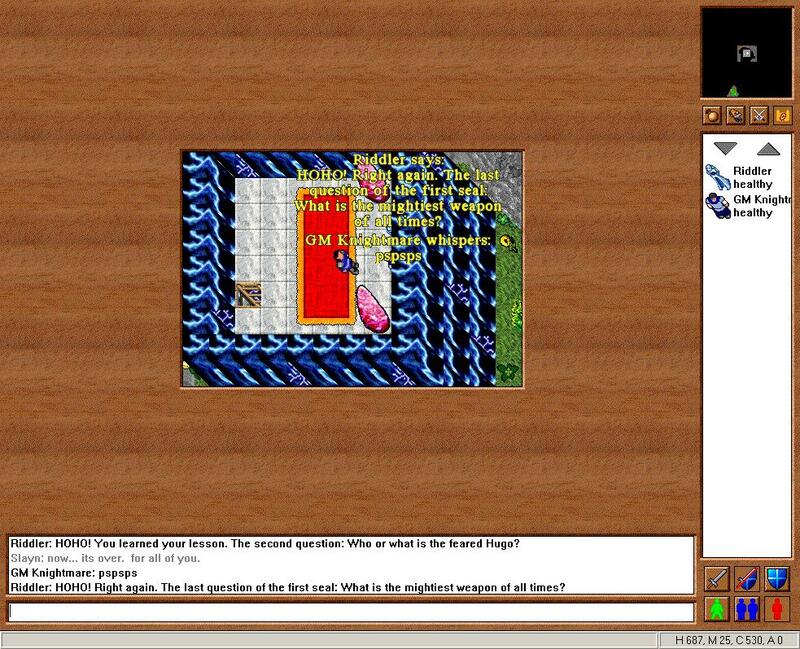 After i started TibiaHistory again last weekend, i was wondering where i would get old screenshots from. I found an old IDE-harddrive in my basement. I had no idea what was on it and since i only have new SATA Drives i couldn’t look into it. So i ordered an adapter which arrived today. One drive is not accessible yet (well i will try again), butthe other one works fine. And picture my suprise as i found an Tibia-Folder with 5GB!! of Data!! I have no idea whats hidden in all this, but i am sure there are many screenshots no one has ever seen. Stay tuned for the things to come. After a long struggle (3-4 years) with CIP a dream of me and the AFT came true. The Tibianic was build into the game. First it wasn’t accesible for anyone cause th guildhouse system was not introduced. But we were so happy that we threw a christening party and gave the ship its name: Tibainic!! I found some long lost videos that i recorded 12-13 years ago on the very old Tibia Client (no idea which version it was). Thanks to the youtube user Patryk001316 the videos are not lost. They were once published on tibia.de and my copies died in an harddrive crash. The 1st movie i want to show you is from the time as there was no Tibianic Guildhouse in the game. My guild, the Alliance of free Tibians (AFT) alllways wanted to have a guildship. But CIP never listened. So we took the matter in our own hands and built a ship out of parcels. The ship was big and had a zoo attached. We made a big party with our friends of the Red Rose. This is the movie to this event. Sorry for the german, but AFT and Red Rose were mainly german players back then.